We celebrate today! 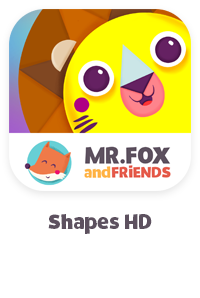 Our Mr.Fox and Shapes game got first home page(US) feature. It's really a big honor for us to share pixels in this category with big players like TocaBoca, SagoSago, Wee society, and other great kids apps devs out there. Thanks Apple! Yesterday we received dubbing of our little fox. It will take some time to implement all sounds, but we can tell you they are really nice. Listen to sample bellow. Isn't he cute? Next week we are going to fix some small bugs, to refine old and add new animations and also to do small changes in gameplay due to our closed beta test. The biggest issue for now are music and sounds effects - we are still not happy with them. 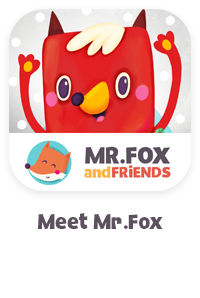 Hopefuly next week..
News #2 - What's The Time Mr.Fox? Amazing voice actor Lani Minela will be the voice of our little fox, main character of our upcoming game What's the time Mr.Fox?. Definitely this was the biggest highlight of recent week. We're looking forward to cooperate with her. 20 min. long skype call with this very nice and charming person left us feeling great. As you probalbly noticed, we said good bye to our red squared fox logo. We redesigned it because it doesn't meet our needs anymore. We are really happy with it now and hopefuly you will like it too. In short period we will rebrand also all our products and social networks. This week we reached some important milestones in development process and we started to work on music and sound effects. We hired our friend Jindrich who worked also on our Mr.Fox and shapes game so we are reallly looking forward. The game is in late alpha stage now and for iOS devices will be in beta soon. If you are interested in helping us with testing and you have iPhone or iPad, simply drop a line at games@mrfoxandfriends.com and we will invite you to our beta test team. You've probably noticed the date of our latest post. Yes it's been almost a year since we did our last one. But not because we are lazy, or that we don't know what to write about. On the contrary, we were too busy with creating our second game and its promotion, to find some little spare time for blogging. But we decided to change it now. We are preparing some posts about iPad and iPhone games that we play together with our son Adam or about books we read together and of course about news from our little studio, how we work from home, how we manage time to have creative working days and still spend lot of time playing with Adam. I said almost…because it was last year when we got the best one - our Adam;) It was the best Christmas ever but also the most stressful one in our life. Little Adam was one month old and we wanted to be the most perfect mom/housewife and dad.